RAROTONGA, Cook Islands, September 3, 2012 (ENS) – Two enormous new marine protected areas in the Pacific Ocean have been designated by two of the world’s countries with the smallest land areas – the Cook Islands and New Caledonia. And the United States government will work with a third Pacific island state, Kiribati, to protect another vast expanse. Opening the Pacific Island Forum in Rarotonga on Tuesday, Cook Islands Prime Minister Henry Puna announced creation of the world’s largest marine park covering nearly 1.1 million square kilometers of the country’s exclusive economic zone, larger than the combined area of France and Germany. The new Cook Islands marine park will be zoned for multiple uses that include tourism and fishing. Deep-sea mineral extraction might also be allowed, said Prime Minister Puna, but only if it can be conducted sustainably. The precautionary principle will determine what activities can take place, he said. Also Tuesday, New Caledonia, a French overseas territory whose ocean expanse adjoins those of the Cook Islands and Australia, announced a new marine protected area covering 1.4 million square kilometers. This area will adjoin the one million square kilometres in the Coral Sea protected by Australia in June. 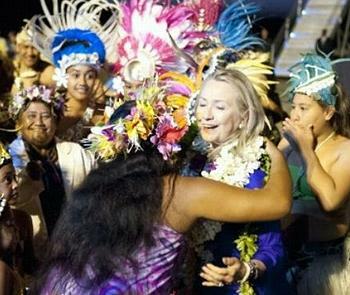 The first U.S. Secretary of State to attend a Pacific Islands Forum, Hillary Clinton declared an unprecedented commitment to ocean conservation in the Pacific Region, deepening the relationship between Kiribati’s Phoenix Islands Protected Area and the Pacific Remote Islands Marine National Monument, a huge area managed by the United States. With an area of 800,000 square kilometers, the Phoenix Ocean Arc will be the world’s largest whole archipelago, trans-boundary conservation partnership. The Phoenix Ocean Arc spans eight atolls governed by Kiribati and two governed by the United States, Howland and Baker. On January 28, 2008, the government of Kiribati formally declared the entire Phoenix group and surrounding waters a protected area, making it what was then the world’s largest marine protected area. The islands and surrounding areas are inhabited by some 120 species of coral and more than 500 species of fish. From the U.S. side, the Pacific Remote Islands National Marine Monument was proclaimed on January 6, 2009 by President George W. Bush. The monument covers 77,020 square miles, spanning areas to the far south and west of Hawaii – Kingman Reef, Palmyra Atoll, Howland Island, Baker Island, Jarvis Island, Johnston Atoll, and Wake Island. All these marine protected areas are part of the Pacific Oceanscape, an idea originated by Kiribati that has gained acceptance across the region. To this end, the United States is expanding its Shiprider program under which ships and aircraft from the U.S. Coast Guard host law enforcement officers from Pacific island nations to patrol their own maritime areas. Since 2009, Kiribati has recovered $4 million in fines by riding on U.S. Coast Guard vessels. Clinton said the Shiprider program will be expanded to U.S. naval vessels and will include more nations. In addition, the United States is working with Australia, New Zealand, and France to strengthen their Pacific maritime surveillance partnership, which puts a particular focus on fisheries. Clinton announced that the Obama Administration will seek an additional $3.5 million to reduce the number of unexploded bombs, shells, and other ordnance left over from World War II that still litter the lands and waters of the Pacific region. $10 million over two years to NGOs to help local communities in the region to become more resilient to climate change. This will focus on the creation of community action plans, and improvements to food and water security. Island countries dealing with climate change impacts will be given a stronger voice in international talks, through an Australian training initiative. A new A$750,000 training program will help to develop the negotiating skills of government officers in Pacific, Indian and Caribbean Ocean island developing countries. This will give these countries a stronger voice both within and outside of the United Nations Framework Convention on Climate Change meetings. 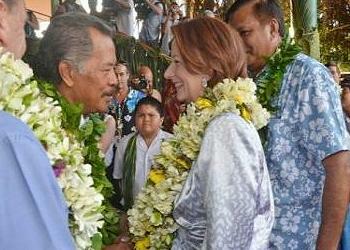 For the past year the Pacific Islands Forum has been led by New Zealand. 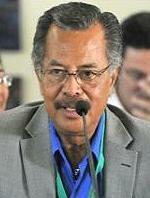 At the 2011 meeting, leaders endorsed the Waiheke Declaration on Sustainable Economic Development. New Zealand Prime Minister John Key told Forum leaders Friday that he is “particularly pleased with how we have all embraced the challenge of making serious progress on renewable energy,” under the Waiheke Declaration. “Most Pacific countries have developed energy sector plans, or energy road maps, and many have set ambitious targets for phasing out their reliance on diesel for electricity generation. And we have seen the commissioning of significant new renewable electricity generation projects in Tokelau and Tonga,” said Key. “There are further sites under development across the Pacific, and considerable interest from the international community in investing in renewable energy initiatives,” he said. They stressed the importance of dependable access to clean and affordable energy to support sustainable economic development and welcomed the announcement that New Zealand would host a Pacific Energy Conference in 2013. They underscored the need to protect the region’s diverse fisheries in order to deliver equitable outcomes for Pacific Island countries and ensure sustainable management of Pacific fisheries. They reiterated their support for successful negotiations to extend the South Pacific Tuna Treaty on terms that ensure long-term economic benefits to the Pacific region and contribute to the long-term sustainability of the region’s fish populations.